Would you like to tie 1,890 knots? These rag rugs have more warp ends than usual. Every four warp ends are tied into a square knot, and pulled tight. 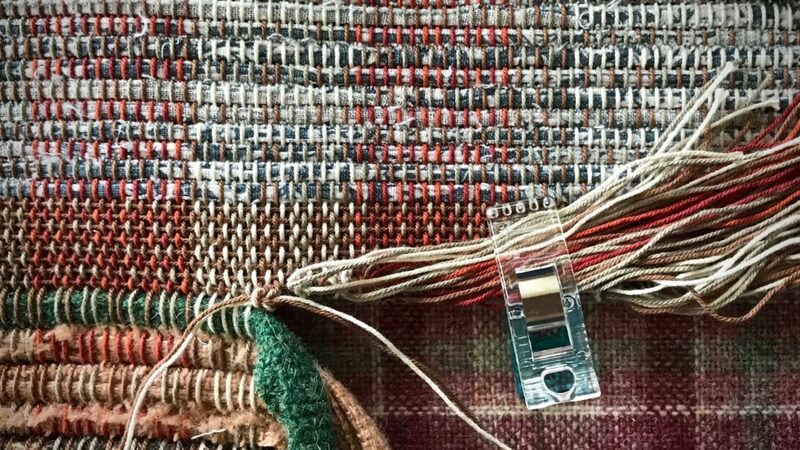 With 756 ends and five rugs, the knots add up! But it’s the best way I know to make the rug permanently secure. Hand-stitched hems will finalize the process. Three of the five spaced rep rugs are finished and hemmed. Two to go. Four warp ends are tied into a square knot. Plastic quilters clip keeps tied ends out of the way. Sacking needles are used for easing the warp ends out of the scrap weft, and for wrapping the thread around to tie tight knots, as shown in this short video: Quick Tip: Square Knots Without Blisters. Christmas is about a heavenly promise. Jesus is the promise of God. Jesus—the word of God in person. The promise of God is as near as our own mouths and our own hearts—we say it and believe it. The promise is brought to us by grace, which means all the knots have been tied for us, and the hem is stitched. It is finished. And we enjoy the permanent security of the Savior’s redemptive love. 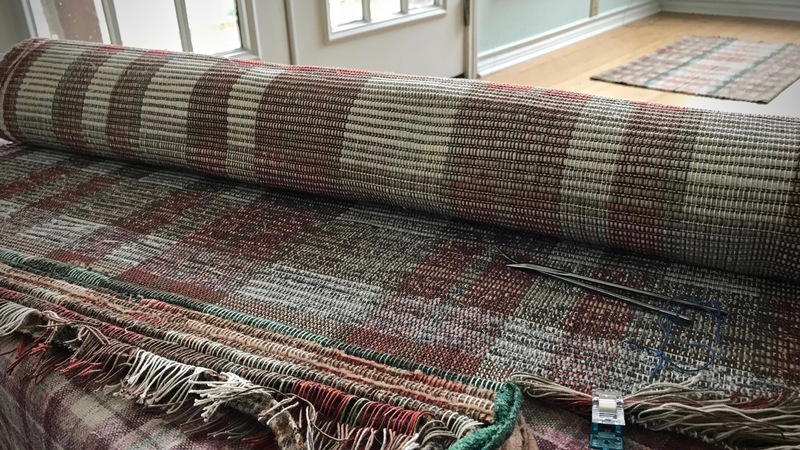 This is no magic carpet, but a handwoven rug with rags that have been made beautiful. May you enjoy a promise fulfilled. That’s a lot of knots! Wondering, since the hems will be turned under could the ends be secured with machine zig zag stitching? Merry Christmas, Karen! Thank you for bringing me joy with your posts. I look forward to seeing them. Hi Beth, I have tried machine zig-zag stitching on some smaller pieces. It’s tricky to get the zig-zag stitches to catch every warp end. But you have a good point. That would certainly shorten the finishing time! I should do some experiments with that. It’s such a treat for me to know that you enjoy these posts! Karen, if you are worrying about catching every thread with the zig-zag, a row or two of close straight stitch would work. Personally, I use my serger, set with a closer than usual stitch, but not every weaver has one. It is much faster with either method. The only time I tied knots like you are doing was when I was binding the ends with a cloth binding. That many knots does give sore fingers! I enjoy your posts and your witness messages. Hi Jenny, Thanks for the pointer about using straight stitches or a serger. The Swedish weaving books that I have instruct to tie knots, so I’ve been following those guidelines. I always appreciate hearing other efficient ways to do things! I learn so much from you, Karen, both weaving wisdom and spiritual wisdom. I am planning to attempt my first rag rug in January. 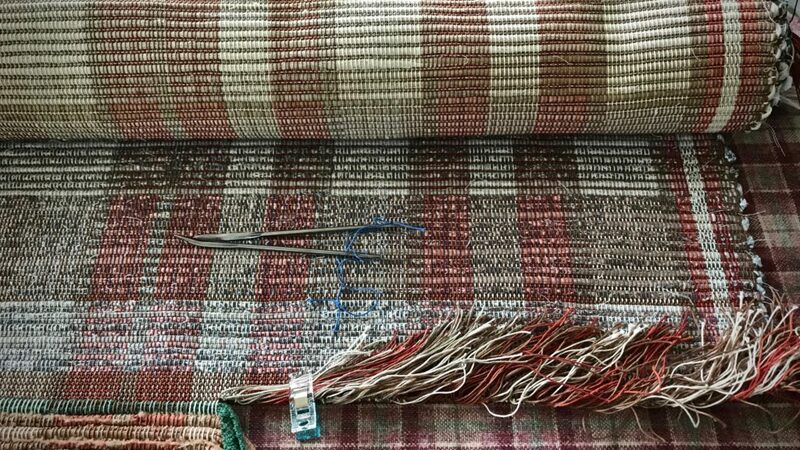 I have already warped my Rigid Heddle loom but I am waiting for January when Ashford will have a Freedom roller available for me to roll the bulky cloth onto the front beam. I am both excited and apprehensive about the new challenge. Thank you for sharing your rag rug tips. Hi Annie, I knew I wanted to weave rag rugs long before I had a floor loom on which to weave them. So, my first rag weaving was on my 32” Beka rigid heddle loom. I didn’t exactly make a rug, but some rag-woven fabric that I turned into little pocketbooks and things. I predict you are really going to enjoy the experience! I just employed an earlier tip, the treadle adjustment cheat sheet, and it’s exceptionally helpful in keeping me on the right treadle. Like so many others, I eagerly look forward to your posts and not just for the weaving tips. Due to a health issue I must avoid large groups so your loving words about our Lord are a major source of spiritual comfort. Thanks for everything! May He who gave Light to the world bring you joy this Christmastide. Hi Joanna, I’m touched by your kind thoughts. It is very satisfying to hear that my weaving tips and spiritual insights fall into welcoming hearts.